The cowboy of the Smokies is a special kind of "dude." He's as rugged as the mountains themselves! He has a knack for spicy foods, strong horses, stylish outfits, and lots of good, wholesome cowboy fun! So what exactly does the Smoky Mountains Cowboy do? Grab yer cowboy hats and boots and let's take a ride into the Smoky Mountains area for a little cowboy fun! BLAIR'S VALLEY RANCH - Nothing is more important to a cowboy than his horse! Not only does it serve as transportation, it's an intricate part of the family, and a special friend. Blair's Valley Ranch is one of the most beautiful spots in the Smokies to board horses! Blair's Valley Ranch offers nightly boarding, pasture boarding, and full-care stall boarding. There's even lodging for people! It includes King's Lodge, which sleeps up to 23 people, plus campgrounds nearby with RV hookups. Blair's Valley Ranch is located in the Wears Valley area of Sevierville, TN. THE COWBOY FESTIVAL - This festival happens every February in the Pigeon Forge area! There's events like quilt shows, intimate dinners, dance classes, western wear sales, concerts, cooking demonstrations, western music, and more. It's the perfect cowboy/cowgirl celebration! STAGES WEST WESTERN STORE - The cowboy has to have a special place to shop! Stages West carries everything for cowboys and cowgirls! You'll love browsing through their huge selection of boots, stylish western clothing, fringe jackets and vests. There's also lots of beautiful jewelry. Stages West is scheduled to re-open in late summer 2016 after a fire tragically swept through their building. However, purchases can still be made on-line, and inside a back room of the building that is currently being remodeled. 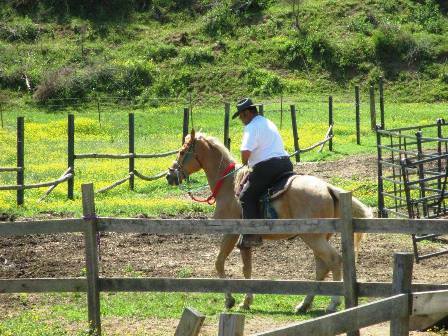 HORSEBACK RIDING - One of the cowboy's favorite things to do is ride through these mountains on horseback! From riding trails throughout all area cities, including Townsend and up into the mountains, there's exciting horseback riding stables that give you the perfect opportunity to enjoy lovely mountain scenery by horseback! There's also hay rides, and carriage rides available. the cowboy and the cowgirl love "going western" in the great SMOKY mountains! SHOOT 'EM UP THEATER - The cowboy is always ready to go after the bad guy at the Shoot "Em Up Theater in Gatlinburg! Look out for those villians! Whether they're hiding behind barrels, or traveling on wagons, they're coming after ya! So aim straight so you can knock 'em dead! It's fast paced 5-D video action that's sure to have you shoutin' "Yee Haaa" as you participate in this cowboy shootout! DOLLY PARTON STAMPEDE - Get ready to "STAMPEDE!" The Dolly Parton Stampede Western show is exciting cowboy fun for the whole family! You don't have to look very far to find cowboy action here! Cowboys and Cowgirls do incredible stunts using horses and other animals! There's pretty saloon girls, country and gospel music, and a big plate of good food ya gotta eat with yer fingers! Come join the friendly competition as the North and the South go head to head to win a few victories and show some American pride. Dolly Parton sings on-screen during the show! Are you ready to become a "Rootin' Tootin' cowboy "Smoky Mountain Style?" You're sure to have a wonderful time enjoying all the incredible things to do while ridin' on the "western" side of these mountains!